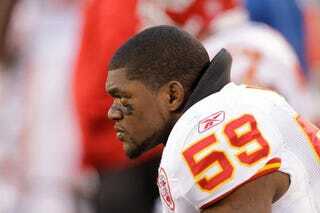 Jovan Belcher's brain showed signs of CTE, according to newly released information in the wrongful death lawsuit filed against the Chiefs after the 25-year-old linebacker shot and killed his girlfriend before committing suicide in 2012. Belcher's brain was examined a year after his death, when his body was exhumed for testing. Belcher's brain was examined by Dr. Piotr Kozlowski in New York, at the request of attorneys representing Belcher's daughter. The attorneys allege that Belcher suffered multiple concussive brain injuries during his time with the Chiefs, and that the team did not adequately care for them. It's an interesting case, because while CTE is by now a widely observed pathology, it still hasn't been strongly linked to these (or any) symptoms through rigorous, longitudinal studies. The evidence is strong enough to force action from the NFL and NCAA, but how it holds up in the courtroom in a case involving very specific symptoms from one player—as opposed to the larger body of evidence of a class-action suit—will be a good window into how seriously the current science is taken. [Bailes] did not study Belcher's brain, but said of the possible findings: "It is of great interest. Violence against others is not typically part of the CTE picture. But it was in the case of [former professional] wrestler Chris Benoit. It would be nice to have these findings corroborated. "If correct, they're very compelling." This cuts a few ways. On one hand, if this is observed on a wide scale, the implications will be significant; brain trauma from sports will take on yet another layer of risk. But researchers have also been careful to not just clump all neurological symptoms onto CTE. There are obvious issues within the body of former NFL players, and those are currently observed and pathologized through the tau protein tangles that were found in Belcher, and dozens of others. But it's still a very new area of study, and there is no consensus on how far along the science is, even among the foremost experts. Belcher's brain turning out to show these symptoms absolutely means something, and we can be pretty sure of the general shape of what that is. But the exact specifics, which are important for a whole heap of reasons—not least of which being how to interpret them in a courtroom—remain.